EZ TRADING COMPUTERS will beat the price of any i7 computer for trading configured* using the customize now buttons on websites owned by: Falcon Trading Computers, Elite Trading Computers, Puget Systems, Digital Tigers or any other legitimate company specializing in Trading Computers. Simply call us at 800-387-5250 or click chat to take advantage of this offer. If you are looking for the best computer for trading, EZ Trading Computers has your technology solution. 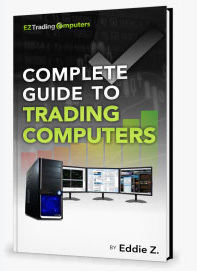 EZ Trading Computers: building the best computers for trading, stock trading, forex trading, futures trading or just about any other type of electronic financial markets trading.